Google Pixel 3 XL, the successor to last year's Pixel 2 XL, last week appeared on public transit in Canada. But now, it has been alleged that someone left a pre-production unit of the Pixel 3 XL in a Lyft cab. The latest revelation shows the back of the upcoming handset along with a Google logo. This is in addition to the front view that highlights the display notch as well as the presence of Android 9.0 Pie. The frontal panel matches the display panel of the handset that was spotted in Toronto, Ontario last week. Separately, two new handsets emerged on FCC that are being registered by Google. It is expected that the handsets are the Pixel 3 and Pixel 3 XL that are likely to arrive on October 4. In line with some previous rumours, the handset surfaced includes two camera sensors at the front - each sitting on either sides of the earpiece. The sensors and the earpiece are embedded in the notch. Further, there is a speaker grill at the front, below the display panel. The back side of the handset that is claimed to be the Pixel 3 XL shows some labels and Google's iconic logo that was available on the previous Pixel models as well. There is also the circular fingerprint sensor and a single camera setup at the back along with a noise-cancelling microphone and an LED flash module. It is said that the Lyft driver found the Pixel 3 XL in the back seat of his car after he dropped off a few passengers. He later returned the handset to the original owner. 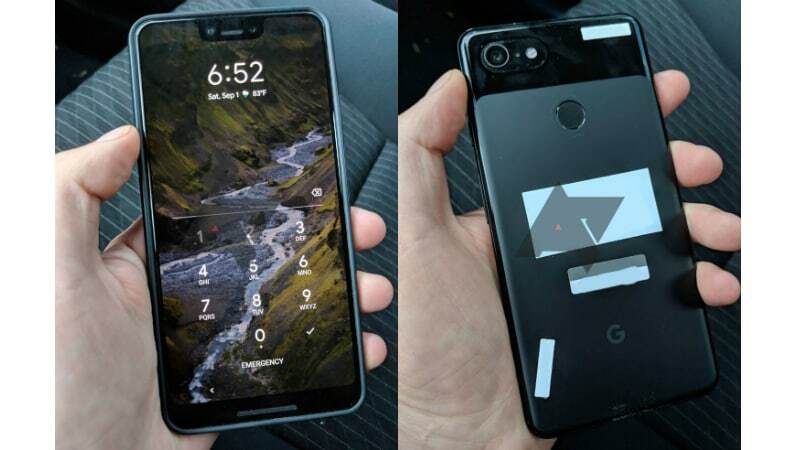 While we can't authenticate the shots leaked by the Lyft driver, two new Google handsets have surfaced on the US FCC site with model number A4RG013A and A4RG013C. It is believed that the former is the model number of the Pixel 3 and the latter is related to the Pixel 3 XL. Notably, Google brought the Pixel 2 with model number G011A and Pixel 2 XL with model number G011C. The FCC listings of the unannounced Google handsets don't highlight any specifications, though these confirm the availability of radios such as LTE, NFC, Wi-Fi, and Bluetooth as well as wireless charging support. Importantly, both models were registered by Google. This suggests that the search giant could consider Foxconn as the manufacturer of the new Pixel phones instead of partnering with HTC and LG. Various documents related to the new handsets were filed with the FCC for certification in early July, while some date back to late June.